Here is your Angel Card Reading & Channeled Message for the Week of 9/10. 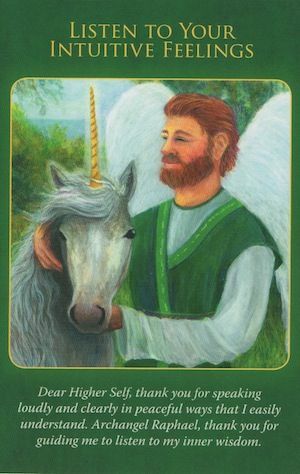 For this week’s message, the angels took me right to the always amazing Archangel Raphael Healing Oracle Cards by Doreen Virtue. One card literally jumped out of the deck as I thought about all of you, and focused on bringing the message through. The card is LISTEN TO YOUR INTUITIVE FEELINGS. This card comes when our intuition has been knocking on the door of our awareness, and we’ve either been ignoring that, or pushing it to the side, or simply not noticing the messages that are trying to come in. Often, when we are children, and intuitive and connected, we are ridiculed for being intuitive and tuned in, and told to ignore it, or we’re accused repeatedly of making it all up. We’re even told to ignore the intuition that says “rest now”, “eat now”, “daydream now” and to instead comply with unnatural, for us, man made schedules which completely override our intuitive feelings and messages. And so, over time, we begin to shut down our intuitive feelings and our intuitive voice. We learn to ignore our wonderful intuition, and to push the important messages and information our intuition brings us ,to the side. Well dear ones, the angels are saying, time’s up for that. The angels want you to reconnect to that voice and those intuitive feelings starting NOW, because that inner voice, and those intuitive feelings have so much to bring to you and to share with you that will only serve you well. Start by repeating the invocations on this card: “Dear Higher Self, thank you for speaking loudly and clearly in peaceful ways that I easily understand.” and, “Dear Archangel Raphael, thank you for guiding me to listen to my inner wisdom.” And then open to receive, to connect with your intuition, to feel instead of brain (aka think) your way along now. You’ll know the answer, if you simply allow yourself to STOP, and tune back in. It’s right there, waiting for you. You can do it, dear ones. It’s time. Stop ignoring that voice, and those intuitive feelings. Let yourself reconnect as it will only make life better. p.s. The 2nd Annual Moving Toward Wholeness One Day Retreat is coming! Join me, and connect to the powerful, life enhancing energies of stillness, hope, joy, personal power, and alignment/congruence. Last year’s Retreat was SO POWERFUL!! Saturday, October ​27th, 9:30 – 4:00. Cost: $225, $75 non refundable deposit to hold your spot. SPACE IS LIMITED SO GRAB YOUR SPOT FAST! Stay tuned for more info!